Pearls and pitfalls of patient selection, limitations, and challenges of incorporating mechanical thrombectomy into the routine health care workflow. Ever since the publication of five randomized controlled trials demonstrating the benefit of acute ischemic stroke intervention (AISI) in 2015,1-5 advances in neurointerventional techniques and devices have transformed AISI into an integral component of the standard of stroke care. According to a 2018 report from the National Stroke Association, there are 175 comprehensive stroke centers and 13 thrombectomy-capable stroke centers in the United States.6 Given the ongoing research to expand the indications for AISI and the recent publication of updated stroke center guidelines,7 the number of AISI-capable hospitals in the United States is expected to rise. As this transformation of stroke care continues, the challenge facing stroke interventionalists and stroke networks will shift from a limitation in AISI access to the ability to maintain and manage high-quality care and outcomes. The initial AISI trials had strict inclusion criteria for patient selection (ie, time of onset < 6–8 hours, anterior circulation large vessel occlusion [LVO], and National Institutes of Health Stroke Scale [NIHSS] score ≥ 10) and interventional approach (mechanical thrombectomy alone).8 In doing so, these studies demonstrated excellent outcomes (eg, improved functional recovery) and limited complications8; however, the strict selection criteria severely limited the percentage of acute ischemic strokes eligible for intervention to potentially 7% to 13% of all ischemic strokes.9,10 Given these limitations, subsequent and ongoing trials have expanded the indications for AISI. Specific areas of investigation in these trials include the use of advanced imaging techniques to assess patient-specific reperfusion risk. For example, the DAWN trial demonstrated the efficacy of mechanical thrombectomy for patients with low infarct volumes 6 to 24 hours after the onset of symptoms.11 Other studies focus on treating more distal occlusions and the development of various AISI techniques, such as arterial access site choice, independent or combination aspiration and stent retrieval, and intra-arterial thrombolysis, thus allowing treatment to be tailored to anatomic and patient-specific considerations. As the variety in patient selection and AISI techniques becomes increasingly heterogeneous, neurointerventionalists must be diligent in their own patient selection and technical decisions to maintain the high quality and effectiveness that is expected of stroke intervention. To address this challenge, we share several pearls and pitfalls from our experience in three critical areas: advanced imaging techniques applied in patient selection, arterial access and support, and mechanical thrombectomy techniques. As the treatment of ischemic stroke extends beyond the 6-hour mark, neurointerventionalists must rely on adjunct imaging techniques and assessments to determine the degree of core-penumbra mismatch to predict outcomes of AISI. Such imaging modalities include CT perfusion, magnetic resonance (MR) perfusion, and diffusion-weighted MR. At our institution, CT perfusion is the primary adjunctive imaging technique in patient selection for AISI, particularly time-to-peak (TTP) and cerebral blood volume (CBV) sequences. Although ischemic core and penumbra in ischemic stroke can be accurately assessed with CT perfusion imaging,12,13 this technique does not replace the importance of a neurointerventionalist’s clinical judgment and experience. Next, we present two potential pitfalls of CT perfusion that can be overcome with good clinical judgment and decision-making. A 69-year-old man undergoing a preoperative cardiology evaluation for a transcatheter aortic valve replacement procedure became acutely hemiplegic and nonresponsive, with an NIHSS score of 19. 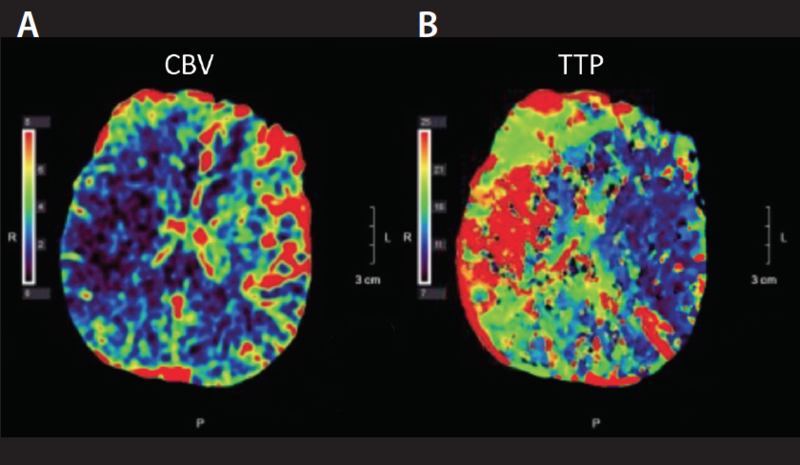 CT perfusion imaging demonstrated right hemispheric increased TTP with decreased CBV, suggesting core infarct (Figure 1). Given the acute onset of symptoms, the patient was taken for emergent mechanical thrombectomy. After mechanical thrombectomy with the Solumbra technique (simultaneous use of a large-bore aspiration catheter and a stent retriever), the patient made a good recovery. On postprocedure day 1, his NIHSS score was 1 and minimal infarct volume was seen on MRI (Figure 2). Figure 1. CT perfusion images showing increased TTP in the right hemisphere (A) with decreased CBV (B), suggesting core infarct. Figure 2. 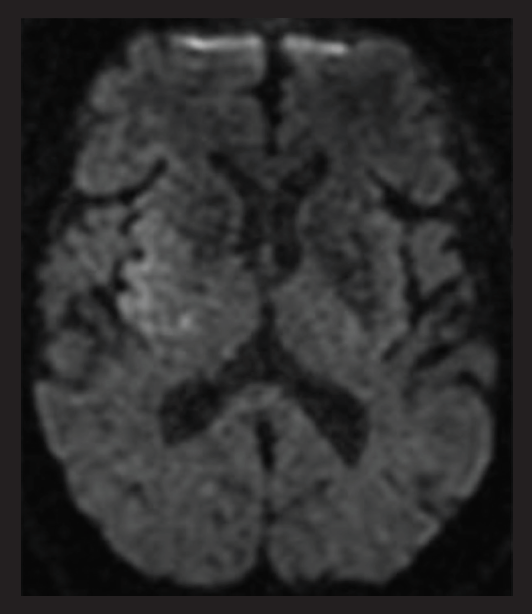 Diffusion-weighted MRI (same patient as in Figure 1) 1 day after mechanical thrombectomy, showing minimal infarct volume. A 77-year-old woman who had been recently taken off of anticoagulation therapy for a gastrointestinal hemorrhage presented to the emergency department with recurrent syncopal episodes. CTA and a perfusion imaging study were performed, and the findings were interpreted as a diminutive basilar artery with well-formed posterior communicating arteries and no focal perfusion deficit (Figure 3). On the following day, the patient became less responsive, and MRI showed right pontine and left posterior inferior cerebellar artery territory infarcts, suggesting perforator and branch vessel infarcts. She was subsequently transferred to our institute and underwent emergent mechanical thrombectomy with three stent retriever passes for a basilar artery thrombus. Figure 3. CT perfusion imaging of an acute posterior circulation stroke secondary to basilar artery occlusion, demonstrating no matching area of perfusion deficit. CBV (A), TTP (B), and CTA (C) showing bilateral large posterior communicating arteries with an acute basilar occlusion. Due to significant bone density artifact of the skull base, the sensitivity of CT perfusion imaging of the brainstem and cerebellum was greatly diminished. In cases of suspected acute posterior circulation ischemia, neurointerventionalists must rely on their clinical judgment based on patient-specific clinical presentation, physical and neurologic examination, and CTA findings. Since the publication of the initial AISI trials, the number of neurointerventionalists performing AISI has exponentially grown,6 and with growth comes variation in surgical technique. The following two technical pearls are derived from our experience in the areas of arterial access and adjunctive catheter support. Major groin access site complications occur in < 5% of patients undergoing AISI15; however, the negative effect of these complications, such as retroperitoneal hematoma, can have a disproportionate effect on a patient’s recovery, especially for those receiving intravenous thrombolytics. Over the past decade, interventional cardiologists have almost entirely transitioned to the use of radial artery access over a femoral approach, due to decreased morbidity.16 We use radial access for nearly 25% of AISIs. When making the decision to undertake a radial approach, there are two important considerations: arch anatomy and need for aspiration. Arch anatomy is the most important technical limitation for radial access in AISI. Specifically, the limitations are an acute angle of the right common carotid artery origin off the innominate artery or right-sided interventions and a contralateral tortuous, long-segment cervical ICA. In both situations, advancing the guide catheter is technically challenging. Another consideration is the limitation on guide catheter size because of the caliber of the radial artery. Further, the caliber of the radial artery may prohibit the use of an aspiration system. The initial AISI trials primarily relied on stent retrieval devices.1-5 Soon after, balloon guide catheters were used to allow proximal flow reversal with manual aspiration, which resulted in improved revascularization rates.17 The technique of aspiration was further refined with the introduction of large-bore distal aspiration suction catheters with or without stent retrieval devices (Solumbra technique and a direct aspiration first-pass technique [ADAPT]). With the introduction of these techniques, it is important to remember the usefulness of a proximal balloon. Balloon guides provide additional support for the microcatheter system, and in cases where the stent retriever occludes the aspiration catheter, proximal aspiration can be performed as an adjunctive form of flow reversal to prevent the release of emboli and improve revascularization rates. Study investigators have advocated the use of ADAPT over stent retrievers for first-pass thrombectomy.18,19 As the patient population for AISI grows, particularly in the area of distal occlusions, we find that the first-pass technique should vary according to patient- and case-specific considerations, including proximal anatomy, size of the target vessel, and atherosclerotic burden proximal to the occlusion. The goal for all AISI is to quickly and safely restore blood flow to the ischemic tissue at risk. ADAPT, Solumbra, and stent retriever–alone techniques each have the potential for successful revascularization in acute ischemic stroke. The key is in choosing which method will allow revascularization in a safe and timely manner. We find that ADAPT is safe and effective for anterior circulation LVOs (ICA and proximal middle cerebral artery) in which the aspiration catheter can be quickly advanced to the level of the clot interface. However, the size of an aspiration catheter limits its ability to approach the clot interface for revascularization of more distal occlusions. In our experience with these occlusions, smaller aspiration catheters and the Solumbra technique have proven effective. Further, there are occasions in which difficult arch anatomy and vessel tortuosity affect access. In these situations, the use of an intermediate aspiration catheter can add support to the triaxial system to allow more distal access. In circumstances where advancing the intermediate catheter or guide catheter is not feasible, we recommend saving time by utilizing a stent retriever–alone technique, knowing that there is a trade-off in terms of revascularization rates. Because stroke is the second leading cause of death worldwide,20 it is critical to the well-being of our communities that we continue to advance AISI techniques to allow treatment of a greater proportion of ischemic strokes. Continued progress on AISI techniques and the expansion of AISI-capable stroke centers will allow neurointerventionalists to meet this challenge. However, we must be diligent in our training and decision-making and learn from one another to maintain the high quality and effectiveness that is expected of and essential for stroke intervention. 1. Berkhemer OA, Fransen PS, Beumer D, et al. A randomized trial of intraarterial treatment for acute ischemic stroke. N Engl J Med. 2015;372:11-20. 2. Campbell BC, Mitchell PJ, Kleinig TJ, et al. Endovascular therapy for ischemic stroke with perfusion-imaging selection. N Engl J Med. 2015;372:1009-1018. 3. Goyal M, Demchuk AM, Menon BK, et al. Randomized assessment of rapid endovascular treatment of ischemic stroke. N Engl J Med. 2015;372:1019-1030. 4. Jovin TG, Chamorro A, Cobo E, et al. Thrombectomy within 8 hours after symptom onset in ischemic stroke. N Engl J Med. 2015;372:2296-2306. 5. Saver JL, Goyal M, Bonafe A, et al. Stent-retriever thrombectomy after intravenous t-PA vs. t-PA alone in stroke. N Engl J Med. 2015;372:2285-2295. 6. Primary and comprehensive stroke centers. National Stroke Association Web site. https://www.stroke.org/understand-stroke/recognizing-stroke/emergency-stroke-center-locations. Accessed October 31, 2018. 7. Pierot L, Jayaraman MV, Szikora I, et al. Standards of practice in acute ischemic stroke intervention: international recommendations. J Neurointerv Surg. 2018;10:1121-1126. 8. Goyal M, Menon BK, van Zwam WH, et al. Endovascular thrombectomy after large-vessel ischaemic stroke: a meta-analysis of individual patient data from five randomised trials. Lancet. 2016;387:1723-1731. 9. Chia NH, Leyden JM, Newbury J, et al. Determining the number of ischemic strokes potentially eligible for endovascular thrombectomy: a population-based study. Stroke. 2016;47:1377-1380. 10. Cohen DL, Kearney R, Griffiths M, et al. Around 9% of patients with ischaemic stroke are suitable for thrombectomy. BMJ. 2015;351:h4607. 11. Nogueira RG, Jadhav AP, Haussen DC, et al. Thrombectomy 6 to 24 hours after stroke with a mismatch between deficit and infarct. N Engl J Med. 2018;378:11-21. 12. Munich SA, Shakir HJ, Snyder KV. Role of CT perfusion in acute stroke management. Cor et Vasa. 2016;58:e215-e224. 13. Koenig M, Kraus M, Theek C, et al. Quantitative assessment of the ischemic brain by means of perfusion-related parameters derived from perfusion CT. Stroke. 2001;32:431-437. 14. Ross BD, Bhattacharya P, Wagner S. Hyperpolarized MR imaging: neurologic applications of hyperpolarized metabolism. AJNR Am J Neuroradiol. 2010;31:24-33. 15. Akins PT, Amar AP, Pakbaz RS, Fields JD; SWIFT Investigators. Complications of endovascular treatment for acute stroke in the SWIFT trial with solitaire and Merci devices. AJNR Am J Neuroradiol. 2014;35:524-528. 16. Romagnoli E, Biondi-Zoccai G, Sciahbasi A, et al. Radial versus femoral randomized investigation in ST-segment elevation acute coronary syndrome: the RIFLE-STEACS (Radial Versus Femoral Randomized Investigation in ST-Elevation Acute Coronary Syndrome) study. J Am Coll Cardiol. 2012;60:2481-2489. 17. Velasco A, Buerke B, Stracke CP, et al. Comparison of a balloon guide catheter and a non-balloon guide catheter for mechanical thrombectomy. Radiology. 2016;280:169-176. 18. Delgado Almandoz JE, Kayan Y, Young ML, et al. Comparison of clinical outcomes in patients with acute ischemic strokes treated with mechanical thrombectomy using either Solumbra or ADAPT techniques. J Neurointerv Surg. 2016;8:1123-1128. 19. Turk AS, Frei D, Fiorella D, et al. ADAPT FAST study: a direct aspiration first pass technique for acute stroke thrombectomy. J Neurointerv Surg. 2014;6:260-264. 20. Cohen AJ, Brauer M, Burnett R, et al. Estimates and 25-year trends of the global burden of disease attributable to ambient air pollution: an analysis of data from the Global Burden of Diseases Study 2015. Lancet. 2017;389:1907-1918. Disclosures: Research grant from the National Center for Advancing Translational Sciences of the NIH (award number KL2TR001413) to University at Buffalo (not related to this article); speakers’ bureau for Penumbra, Inc.; honoraria from Neurotrauma Science. Disclosures: Coinvestigator for NIH/NINDS 1R01NS091075 Virtual Intervention of Intracranial Aneurysms (not related to this article); financial interest/investor/stock options/ownership in Amnis Therapeutics, Apama Medical, BlinkTBI, Buffalo Technology Partners, Cardinal Health, Cerebrotech Medical Systems, Claret Medical, Cognition Medical, EndoStream Medical, Imperative Care, International Medical Distribution Partners, Rebound Therapeutics, Silk Road Medical, StimMed, Synchron, Three Rivers Medical, Viseon Spine; consultant/advisory board for Amnis Therapeutics, Boston Scientific Corporation, Canon Medical Systems USA, Cerebrotech Medical Systems, Cerenovus, Claret Medical, Corindus, EndoStream Medical, Guidepoint Global Consulting, Imperative Care, Integra, Medtronic, MicroVention, Northwest University. Disclosures: Consulting and teaching for Canon Medical Systems Corporation, Penumbra, Inc., Medtronic, Jacobs Institute; cofounder of Neurovascular Diagnostics, Inc. Disclosures: Shareholder/ownership interests in Intratech Medical Ltd., NeXtGen Biologics; Principal Investigator for Medtronic’s United States SWIFT PRIME trials; honoraria from Medtronic; consultant to Pulsar Vascular; advisory board for Stryker, NextGen Biologics, MEDX, Cognition Medical; other financial support from Abbott Vascular for carotid training sessions.